In keeping with past years statistics, below is a quick summary of what web traffic looked like in 2012. In 2011 my blog took 108,325 visits and 140,882 pageviews, while in 2012 it took 76,630 visits and 97,964 pageviews. Last year I was happy to see that the number of visits and pageviews were increasing, not to their highest levels when I was regularly blogging about technical topics but it was nice to see regardless. This year however, something drastic happened in April and after digging into Google Analytics the first date that traffic plummeted was April 24, which was the date Google rolled out a new algorithm named Penguin. The Google Penguin update was designed to combat several different over optimisation tactics that are commonly used in online marketing to drive more visits from Google. Fortunately while I fell victim to the original update, I was given a reprieve in late May when Google made an update to their algorithm – though traffic never returned to the exact same levels before. What is surprising to me is that I was penalised at all by the algorithm. I haven’t performed any search engine optimisation on my blog, aside from configuring a few common WordPress plugins that everyone uses and except for my commenting legitimately on interesting blogs online – any links to my website are 100% organic. It comes as no surprise that Google still dominate the traffic to this blog, like they do to most websites around the world. Following on from last year, Google organic search continued to contribute ~78% of the traffic to the entire website. Bing & Yahoo! (which uses Bing from a search engine technology stand point) continue to provide a dribble of traffic, contributing just over 3% compared to 3.5% from last year. I haven’t bothered to keep a close eye on the health of my blog this year and I’ve suffered as a result. Had I have been keeping an eye on things, I’d have noticed the significant decline in traffic toward the end of April and could have started to take action to rectify those issues. Of course, there is nothing stopping me doing it now either – so maybe I’ll spend a little time on some analysis to see what Google might be complaining about. Onward & upward for 2013! In keeping with my annual review of things and following on from my 2010 website traffic statistics, below is a quick summary of what happened during 2011. Throughout 2010 my blog took 97,509 visits and 132,068 pageviews and for the year of 2011 108,325 visits and 140,882 pageviews. It is nice to see that my sites visitation has grown over the year, however it is a long way from the hay days of 145,000 visits when I was writing technical style posts and a mixing it with pop culture items like Australian Idol. Breaking down the traffic sources for the year, shows a 4% increase in search engine traffic as a percentage of the whole site, up from 74% to 78%. Within the search engine space, Google continues to completely dominate, increasing by 2% to just under 96%. Despite every effort made by Microsoft, such as buying the search engine business from Yahoo! 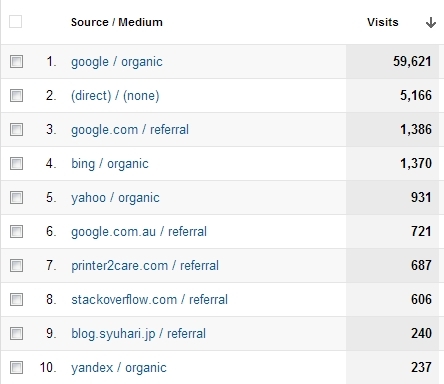 in an attempt to gain market share – it isn’t reflected in the traffic for my blog and collectively Bing & Yahoo! 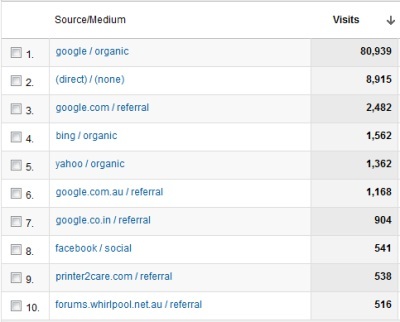 represent about 3.5% of my search referrals. Bring on 2012, with a bit of luck the landscape will have changed by then again. Every once in a while, I go through this site and perform some general housekeeping and website maintenance work. The last time I performed a big chunk of maintenance was back in 2008 when I went through and consolidated about 25 categories and subsequently re-categorised a huge number of posts. The time has come again, this time it is to do with the how I format images within posts. Back in the earlier days of this site, I used a custom image formatting setup which looked quite cool but is less practical. With the more recent versions of WordPress, I just want to be able to use the WYSIWYG editor and focus more on writing and less on the formatting issues. I’ve got about 80 or so old posts to go through and do a little tidy up on, so I’m thinking I might have it done in dribs & drabs by the end of the week. Following on from my 2009 web statistics, below is a summary of what traffic the site took in 2009. In 2009 the site took 106,930 visitors over the entire year which resulted in 136,525 pageviews. During 2010, the site generated 97,509 visits and 132,068 pageviews. That figure is down from my two biggest years of approximately 145,000 and 135,000 during 2007 and 2008 when I was posting less frequently but the posts were of a more technical nature and also pop culture related such as Australian Idol. It’ll come as no surprise that from a traffic driving potential, a lot fewer people are interested in reading about my personal ramblings compared to technical style posts that I used to post. During 2008 and 2009, I wrote a couple of posts each year that grabbed a moderate amount of traffic and were clear standouts with respect to the number of pageviews. During 2010, none of my posts really caught the attention of the internet; which per above can be attributed to the topics that I’m writing about. The traffic breakdown by source shows a considerable decrease in the reliance of search engines, with their traffic percentage falling from around 85% in 2008-2009 down to only 74% in 2010. Within the search engine space, Google are completely dominating with 94% of the search engine traffic. During 2009, Yahoo! were the first non-Google search engine with about 2.5% & Microsoft Bing was the new kid on the block. Fast forward a year and the tides have turned with Bing now accounting for 2.6% and Yahoo! 2.4% of the search engine traffic. ASP Error ‘ASP 0104: 80004005? It is probably worth noting that nine out of ten of the highest traffic web pages on my site are not about anything to do with myself or our family but are in fact to do with helping others. This makes a lot of sense, especially when you see the meteoric traffic growth question and answer sites Stack Overflow and Quora have seen in the last two years. Onward and upward for 2011! Claire & I have recently been on the look out for a new compact digital camera, to replace our aging Canon Ixus 65. During our research process, we’ve looked a countless cameras on the internet, via the manufacturers’ websites, consumer electronic web sites such as cnet and read countless reviews. When it came time to actually buy a digital camera though, we were going to buy it in person at a local Gold Coast retailer such as Harvey Norman, The Good Guys or similar. What we found was, while they had prices that were better than the recommended retail price by the manufacturer and some were going to be flexible on price, they were still quite expensive. Inevitably when people start researching online for a product, they’ll start with a search engine with looking for the best compact digital cameras. The results will yield sites such as a digital camera product round up on cnet and a number of companies will be paying for advertising on Google & co. as well. While possible, it was going to take a lot of time to sift through all those sites to find the best deal and this is where the comparison shopping websites become the consumers best friend! Comparison shopping web sites crawl over literally tens or hundreds of different ecommerce web sites, cataloging what they find and how much each product costs. Of course, the comparison shopping websites aren’t just for digital cameras – you can buy all manner of things via them from fridges to perfume, pet supplies to furniture, there aren’t a lot of things you can’t find. As a consumer, you enter the product name or product category into these sites and see dozens of different companies selling the same product, with wild variances in price. They all have a similar feel about them, however the interface and how the products are cataloged and organised differs by site – which makes some easier to use then others. In the case of the Canon Ixus 200 IS digital camera we purchased, it retails for approximately $600 for the bare camera chassis. Claire bought it via Shopping Square, a massive online store that we’d never heard of before but discovered by the comparison shopping sites. For less than half the retail price of the camera on its own, we managed to get the camera, a 16Gb memory card & prompt postage. Next time you’re looking for a product that you can buy online, I highly recommend that you do yourself and your wallet a favour and visit one of the above sites before you spend a whole lot more money than you need to.